Twenty-two dollars later, I was the proud owner of this hat. It’s the most bizarre shade of yellow. Ugly, even. While I could go on and on about how odd the colour is, the actual purchase process is what I want to talk about. See, I picked it off the rack and took it to the counter. Swiped my credit card, and then the saleswoman asked if I’d like a bag. She proceeded to remove and discard the cardboard insert (that kept it upright on the shelf) and then went to cut the tag off. Nothing too crazy, right? Then she stopped and looked at me — sizing me up, I’d assume — and asked if she should leave the size sticker on. “Excuse me?”, I said in total confusement. 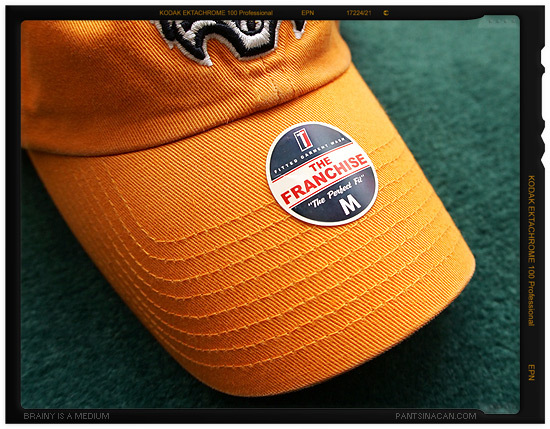 Then when she handed me the hat, I peeled the sticker off and put it in my pocket. (Yes, the photo above is a re-enactment of the actual event…) She kinda gave me a “whatever” kind of look as I pulled it on to my “medium” head. See, when I was in university, that fad of leaving the tag on a baseball cap started to gain momentum. I never took part — I mean, what better way to get stopped for shoplifting that wearing your clothes with the tags still attached? Not only that, it looked ridiculous. No one in my clique ever did it. Thinking about it, no one ever would. Nowadays, it seems that look has faded, which is probably why the saleswoman so abruptly and instinctively cut the tag off for me. The college-age kids she deals with day-in and day-out don’t sport that look anymore. Yeah, don’t ask — I’m too old to understand it, but fashion conscious enough to notice it. Again, it looks stupid to me. I mean, why would you do that? Does everyone need to know that the hat is officially licensed merchandise? Or, worse yet, that I have a size medium head? Does anyone even care? What’s next? Are we going to start leaving the sticker on the leg of the jeans too? Yeah, that’s right, look at that, I’ve got a 34-inch waist. You like that? Yeah? Are Home Values Important to the Economy?